We’re writing to inform you about our growing list of English translations at Profusion publishing house. 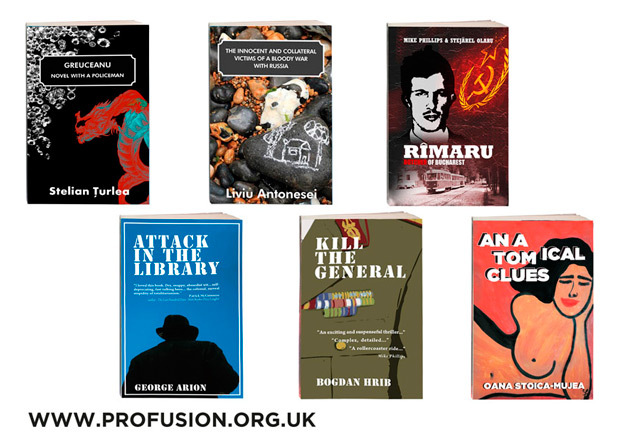 When we started publishing under the name Profusion, in 2011, our aim was to bring aspects of East European literary culture, hitherto unknown in Britain, to the attention of the reading public. This was because most publications from the region were, more or less, “highbrow”, while popular stories and genres such as crime fiction tended to go unnoticed. Our list of books and authors is therefore a factor in increasing knowledge throughout Europe about the life and prospects of ordinary men and women in the region. The founders and directors of Profusion areMike Phillips and Ramona Mitrica. Ramona is a former Romanian diplomat, now a British citizen and based in London. Mike is an English novelist and screenwriter, whose publications include “Windrush: the irresistible rise of multi-racial Britain”(HarperCollins), the BBC TV series “Blood Rights”, adapted from his novel of the same name, and, more recently, the true crime story, “Rimaru - Butcher of Bucharest”. All our books are available in paperback, as well as Kindle e-books. Books are available in Romania as well, from “Anthony Frost English Bookshop” in Bucharest (www.anthonyfrost.ro). 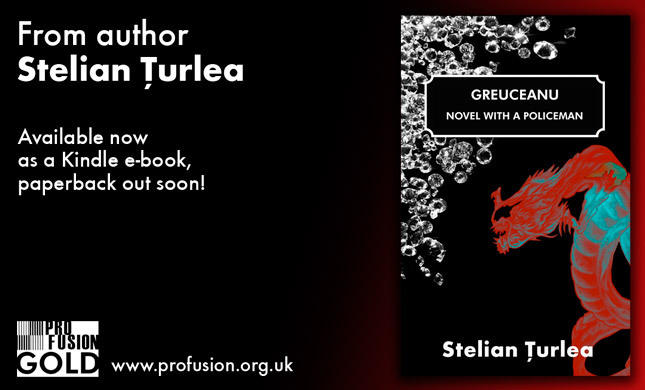 With the unerring instinct of a popular children’s author, Turlea locates, in GREUCEANU, one of the major Pan-European issues in contemporary times, the problem of organised crime. Turlea’s villains are not moustachioed banditos. Instead they are the brothers and sisters of gangsters in every European city centre, and playing as he does with the characters of the town, he explores a number of insights into the role of organised crime in post-Accession civic life. Greuceanu is a young policeman, at the bottom of the ladder. By chance, he gets rid of one of the feared gangsters, whose brothers and their wives come after him. “The Innocent and Collateral Victims of a Bloody War with Russia” is Liviu Antonesei's latest collection of short stories, which track the experiences of a Romanian intellectual in the years since the political upheavals in his country and the surrounding region. They make for an exciting, insightful and provocative read about the events happening right now in Eastern Europe... These seductive short stories are an ingenious merger of simple life, essay, diary and reportage. A deeply reflexive meditation on the history of Doctor Cassian, from the Second World War to contemporary times in Romania, told through the experiences of a panoply of characters and events. In counterpoint, the novel details the reflections of a young woman, Mara, and her relationship with the doctor. The book explores, in depth, the Romanian landscape over more than 70 years, subtly locating the history of a myriad of individuals and events within their broader European context, as well as describing the conflicts and opportunities of the post-Accession generation. It is an important contribution to broadening European understanding of a little known history and culture.